In the beginning the neighborhood was called Watts Varrio Grape (WVG), which included both Mexican and Black members together. 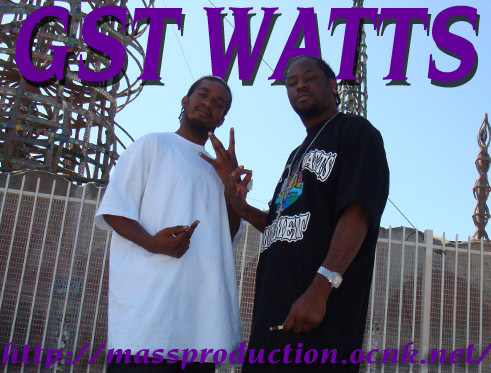 When the Mexicans aligned themselves with the Sureno 13 banner, the Mexican members changed their name to South Side Watts Varrio Grape Street 13 and the Black members went by East Side Watts Varrio Grape but by around 1986/87 the new Black members were known as East Side Grape Street Watts Baby Loc Crips. All new members after 1987 from the Jordan Downs projects went by this new name but some of the new members from the Anzacs, 95th, 97 Banderas Block, 105s, 107s and 112s clicks do not necessarily go by the name Baby Locs, but all the new members from the projects (103rd Street click) do, therefore new Black members do not claim WVG anymore, but some long time members of this neighborhood (pre-1987) still by habit say WVG and have WVG tattoos. Their main rival would be the Bounty Hunter Bloods but since the truce of 1992 their rivalry has not been as intense as it was during the 1980s but it does flare up periodically. The truce efforts that took place in Watts in 1992 should be a great example of what can be accomplished in other areas of the city if replicated in other neighborhoods. The Grapes have several clicks that make up the entire neighborhood that include the following: Baby Locs, Peta Roll Squad, Peta Roc Squad, Peta Loc Squad, Parolee Squad, 95th, Bandera Blocc 97, 103rd, Dust Town Crip, Dust Town Hoggs, and Tip Top. The Grape Streets have aligned themselves with most Tray neighborhoods such as the Eight Tray Gangsters and Play Boy Gangsters, most Compton Crip sets, and they have had a tenuous relationship with the Rollin 30s Crips. Their area goes from 97th Street (north) to 107th Street (south) between Wilmington (west) and Alameda (east). They are the largest Crip neighborhood in Watts at 0.394 square miles and the second overall black gang in the area, 2nd to the Bounty Hunters. In addition to wearing blue, they like wearing purple for grape. They are named after a north-south street in Watts, and 103rd is the heart of their neighborhood. They occupy the Jordan Downs Housing Projects and attend Jordan High School which is located adjacent to the projects. Last edited by venciiiha on Sat Mar 27, 2010 6:39 pm, edited 1 time in total. Good luck, especially because you will be raped by old members of CBB like me, whose are still RPing the gang. I hope to have a fair RP and enjoy our-selves as enemies. Lol, good luck with this. He obviously didn't want to, there's nothing wrong with creating your own faction. Good luck, Venci. Looks like you put some effort into this. Good luck because it seems that whoever's in Jefferson gets mauled by Felton. Make alliances, and don't be loud or this faction will fail because of the surrounding gangs. Good luck to you! Nice effort you putted into this thread.
" Just when I thought I was out , they pulled me back in! " Reo wrote: Good luck, especially because you will be raped by old members of CBB like me, whose are still RPing the gang. I hope to have a fair RP and enjoy our-selves as enemies. OT: good luck with the gang. Good luck, i hope we will have a good relationship between the two crip factions. LSPD/SASD Casefile wrote: Mauricio ‘Casper’ Ortiz has remained leader of Colonial Watts since it was established and is credited with being one of the co-founders of the organisation. It is believed he ordered his subordinates to enforce beatings on those who attracted police attention. Colonial Watts have been able to avoid significant police attention for much of their existence. He and his soldiers have fought in bloody street wars with other organisations, most of these disputes appear to end by Ortiz's choice. It is also worth noting that he has ruled over the organisation in a dictator-like manner. Can't say anything else but...Good Luck.